SignsSeen: Newly designed SignsWork site released! Newly designed SignsWork site released! Brighter colors and eye catching images. Fully database driven website. 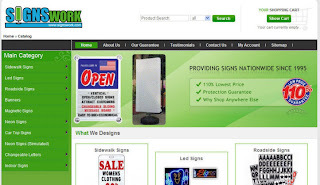 The new SignsWork is better able to help you buy the signs and sign accessories that you need! New product categories and new product lines! We have refined the products we carry to provide you with the sign products that are the easiest to use and provide the best support from our manufacturers. Please check out the new site, and let us know how YOU think it is better than the previous site.